Melt the ice cream just long enough to soften it. Add swirls of food coloring to make it look like you’ve melted a crayon into it. Try purple or green to make kids giggle. 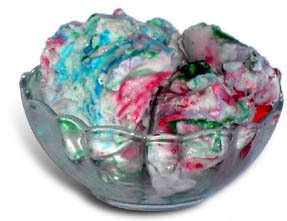 Try red, blue, and green stripes to make toothpaste ice cream instead.